The grilled ham of Saint Oyen is a boneless ham lightly smoked, sprinklend with chopped fresh herbs and browned slowly on a spit of enormous braziers stoked by fir wood or larch, alder or ash coming from the San Bernardo valley. During the slow cooking on the grill, which is essential to obtain the characteristic golden color of the rind, the ham is constantly watered with a mixture of white wine and honey with the add of seasonings. 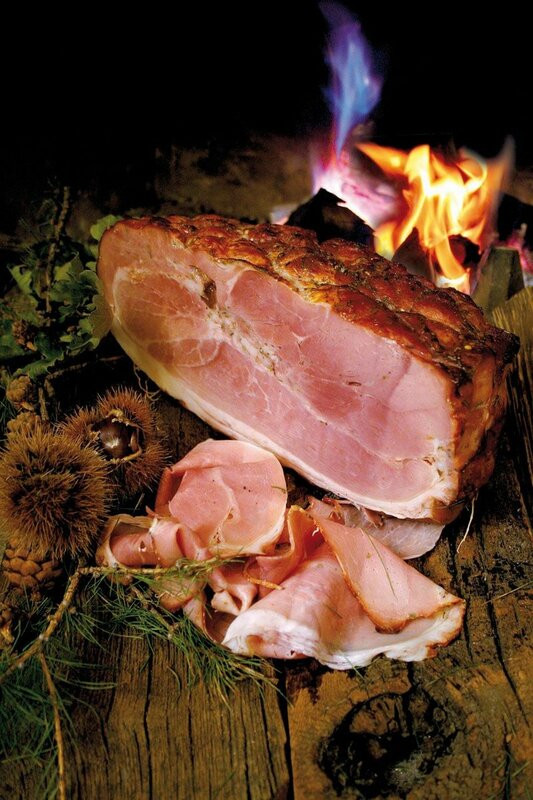 This ham is a traditional food product recognized in the decree of July 10, 2006, published in the Official Gazette whose processing must take place exclusively in the small village of Saint Oyen, as imposed by the strict instructions of the regulation. To best exalt the characteristic of taste and lightness of the product, it is recommended to warm it a few seconds and serve accompained by boiled potatoes or green beans. Since 1968 has started the annual festival of this italian typical meat which is organized in the first Sunday of August in a festive atmosphere and full of entertainment. To come visit us during this event, please contact our partner travel site Leibtour.com.